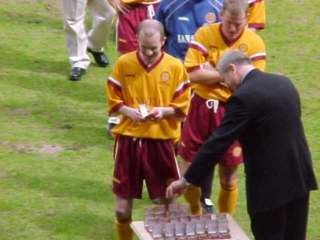 The nostalgia weekend continued at Fir Park on Saturday afternoon as the Cup Winner's Team took on a Former Players select. Around three thousand filled the main stand as their heroes played out an entertaining 6-6 draw. 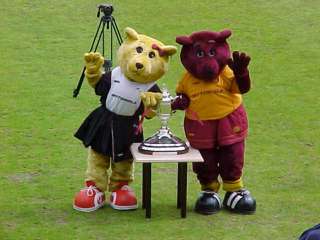 Memories flooded back as many of the fans' favourites over the last twenty years entertained a support which has been unable to celebrate the arrival of new silverware in the last decade. There are rumours that the current manager is tempted to sign some of the talent on show. Nijholt and Arnott looked especially good while Coyne and Kirk showed that they are still capable of giving defences a problem or two. A sprightly looking Matt Johnstone attracted a fair bit of attention from the crowd in the second half but it seems unlikely that BD will be pursuing any interest. 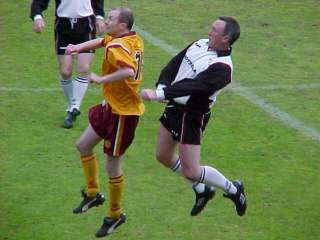 Joe Wark and Colin O'Neill may have to lose a pound or two before they come into consideration! At half time the score was 3-3 after goals from Arnott and Kirk put the Winners ahead. Two from Coyne (one from the spot after Cusack fouled Coyle) and further contributions from Kirk and Nevin levelled the score. 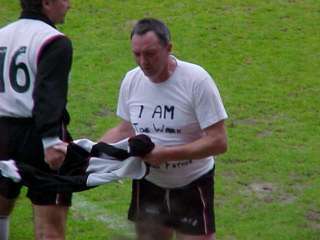 He knew Joe Wark's father best of all!. The second half seemed to flow at a more gentle pace than the first, Nevin crawled back to the halfway line after scoring! Goals from new boy Johnstone, McKinnon, Cusack, Martin, Arnott and Coyle gave the crowd plenty to cheer as the subs came on and off at a rate of knots. At one stage psycho was 'sent off' though he reappeared after a breather and with fifteen minutes left Kirk swapped jerseys with Maxwell and played in goal. At the end of the game all participants (including the Winner's management team of McLean and Forsyth) were presented with a commemorative medal to a standing ovation. Not a dry eye in the house! The proceeds for the game are going to the deserving Children in Distress Charity and John Boyle promised to match the amount raised by the club. Matt with a smile a mile wide! 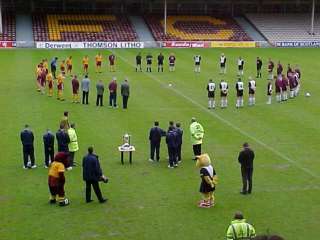 The one moment of sorrow during the afternoon came before the match when a minute's silence was observed in memory of Davie Cooper.